Hardy Corporation was founded in Birmingham, Alabama in 1943 by Frank L. Hardy as a mechanical contracting company serving the emerging commercial air conditioning market. Since then we have grown to become a nationally recognized, open shop HVAC, plumbing, piping and full service contractor serving commercial, industrial and institutional customers throughout the Southeast, Mid-Atlantic, and Midwest. With over 10,000 completed projects, we have the experience and resources to handle a vast range of projects from a full service hospital to tenant build out project. 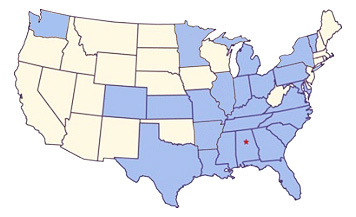 Hardy has completed projects all across the United States. We believe our large base of repeat clients is due to a successful record of installing quality systems on-time and within budget. We are typically engaged in approximately 50 projects and employ 300 to 350 personnel. This large volume allows us the flexibility to staff both large and small projects on short notice. Safety is not a priority; priorities can change. Safety is a VALUE at Hardy. The safety of our people and those working around us cannot be overstated. Safety will not be sacrificed to meet schedule or production. In order to meet our ever growing high demands for safety, Hardy employs a Safety Director, a full time Certified Safety Professional and several full time Assistant Safety Directors. We have safety professionals on staff with the credentials and expertise to teach in house safety classes which provide certifications such as 30 hour OSHA, 10 hour OSHA, first aid, etc. Hardy has been awarded the ABC STEP Award for safety the past 11 years. In 2007, Hardy received the Corp of Engineers Superior Safety award. “We just want to do the right thing.” This is a quote from Tom Cordell, President of The Hardy Corporation. When it comes to safety, doing the right thing is a management value at Hardy. Evident by 17 straight years of credit Experience Modification Rates, Hardy is dedicated to providing the safest workplace possible to its employees. Hardy continually invests in safety through employee safety training and the ongoing management of its formal safety program. -Steve Searle, V.P. Account Services, Employer’s Claim Management, Inc.